How Can Medical Education Train Socially Responsible Physicians? Cherukupalli A., Tan C.N., Blair G.
Lum N., Ohm H., Sagorin Z., Tsang V.W.L., Yu A.
Nguyen T., Tsang V.W.L., Randhawa P.A., Rosenkrantz M., Amirie M., Bhatia F., Drabkin L., Kim J.L., Leung A.S., Tang J.K.K., Singh T.K. Zhao E.Y., Nguyen K., Tinker J., Lu D., Liu J. Should We Be Teaching Medical Students to be Moral Isolationists? 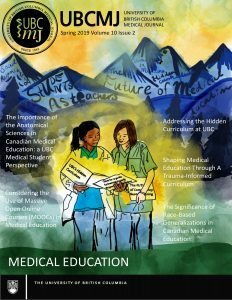 The Problem of Unmatched Canadian Medical Graduates: Where Are We Now?